If you are looking for a replacement for iWeb, look no further than here: WordPress.com has matured into a convenient website creation tool. Sure, it is not an App as it is web based, but it allows to work your site on any Apple iDevices (iWeb was never release for iPad, iPhone or iPod touch). Sure, it might not be as WYSIWYG as iWeb or other App, but the template are nice and flexible enough for most users. Contrary to iWeb, you will also find that a WordPress.com website is much lighter and hence faster to load and dynamic (i.e. presentation changes based on which device is used to access it, like an iPhone…). 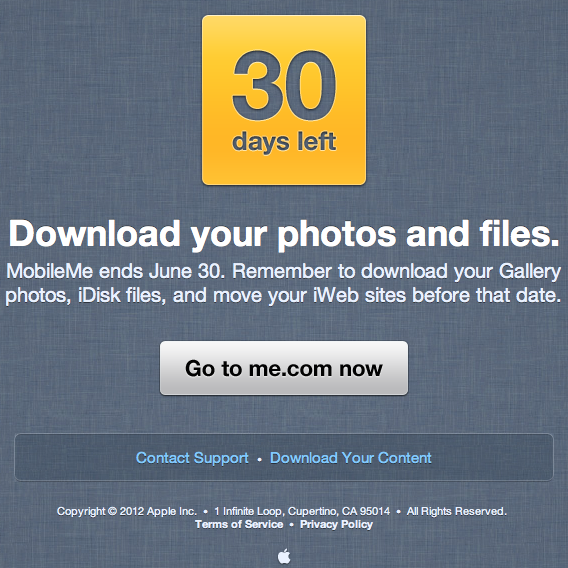 The MobileMe galleries were well integrated with iPhoto, but creating one in WordPress.com is as easy as drag and drop. Alternatively, for galleries, consider ZangZing (Edit 2012-08-05: ZangZing will be shutting down on 2012-08-31). I will miss the iDisk: its integration in MacOS X and how easy it was to share files hosted on it… However, by then, people must already know DropBox. It is an excellent alternative (and didn’t you find the rate of transfer of the iDisk appalling? Slower than old good FTP/SSH…). Forgotten dotMac, farewell MobileMe, long live iCloud! Here is some information about the various batteries used in Swatch® watches I have around me. The alternative… solar powered watches like the Citizen Eco-Drive. These require no maintenance that might compromise their water resistance! WordPress offers so many themes! I am looking for something that is comfortable to read and not over stylish. I will get started with Notepad as it ticks all my boxes in terms of functionality and it has a very clear layout.